So this is like, totally, The Best Primer. Ever. In the world. End of*. This is a seriously slinky primer. It's a particularly silicone-heavy formula, but unlike the other two in a similar vein that I've tried (l'Oréal Studio Secrets Smoothing Resurfacing Primer and Clarins Instant Smooth Perfecting Touch - the latter the slightly better version of the two), this is fluid, liquid and silky in comparison to the slightly gritter textures of l'Oreal SSSRP or Clarins ISPT. As with all good primers, it helps do all the things good primers should do. It helps to even-out your skin and blur (minor) imperfections, (slight) redness, (small) pores and (very) fine lines. It provides a barrier between your face and your makeup. It helps prolong the life of your makeup. In addition, it contains an SPF15 (courtesy of titanium and zinc dioxide) which helps shield your skin from the sun (it's only a 15 however, and beware, as it also flashes back quite noticeably in flash photography). As with most primers, you can apply this with either a brush or your fingertips. As with most primers, fingertips work best. Lob it on after of your normal skincare routine, and before your foundation. It works pretty well with most foundation formulations (cream, liquid, powder) although I found it worked better with powder-, silicone- or water-based foundations than oil-based ones. If you have the cash, honestly, it's the single best primer I've ever used. Ever. It doesn't pill or ball (like some cheaper primers can). It hasn't caused any dryness or flakiness (like some heavier-in-silicone primers can). It doesn't stink to high heaven (hello a certain Industry Standard Primer, yuck). It doesn't promise the world and deliver a sweet nada (as with some other mineral-based primers I've tried out). It definitely does all the things it promises and all the things a good primer does and it definitely extends the life of my foundation by maybe two hours or thereabouts (sufficient for my face to now last the entire working day from application (7am) until close-of-business (5pm) with no need for topping-up, a major plus in my book). A warning. This flashes back. Or ghosts. Or causes Extreme Scary White Face in flash photography. Remove the SPF and you've got a primer I'd recommend to the world and its mother. But brides beware, this one ain't for you. 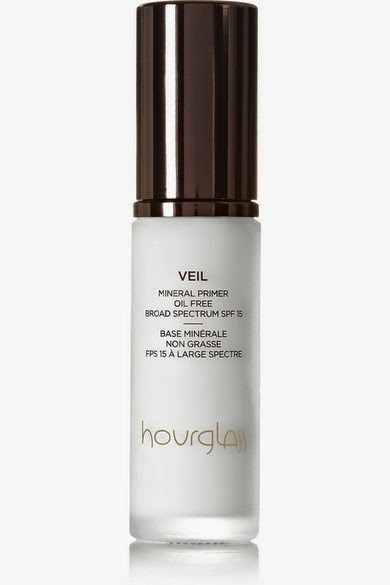 According to Hourglass, this is designed to be used by all skintypes, has a satin-finish, is free from oil, parabens, phthalates, gluten, sulfates and fragrance. It's even supposedly vegan friendly. All good things. It's also eye-wateringly expensive - €62 for 30ml (although I do believe it also comes in a smaller size for around the €20 mark). You'll find it on Net-a-porter or in SpaceNK (which I've been given to believe is coming to Grafton St. Dublin... squeeeeeeeeeeal).